It is my pleasure to announce that by all appearances, Marcelo Gervasio Silva of Rio de Janeiro, Brazil, has unofficially broken my world record for the longest journey by skateboard. 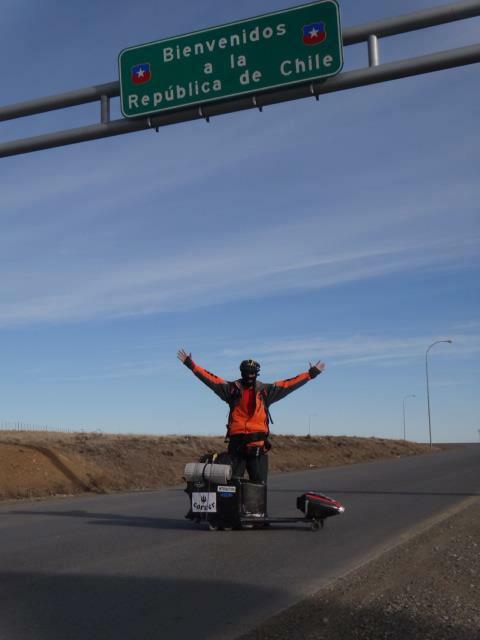 Apparently he started his journey in French Guiana on the 26th of January 2011, and has to this date skated over 23,000km around Brazil and Southern South America (Uruguay, Argentina, and Chile). Read on to find out how you could help Marcelo get the recognition he deserves. Details about the journey are a little scant (mainly because I don’t understand Portuguese), but from what I’ve seen on his Facebook page, the journey has been epic, especially this past southern-hemisphere winter, as he skated through Uruguai, Argentina, and Chile. I’ve had a few emails back and forth between Marcelo and I, and he tells me that the journey has a couple of motivations. He says the journey is, first and foremost, in memory of his father, who passed away in 2004. While this is the biggest motivation, he also wants to see skateboarding be promoted as a healthy past-time for kids in Brazil. He is a passionate activist for getting kids off the streets and into life-affirming physical activity. And skateparks are a big part of this (he’s been a skateboarder since 1967). Along the way on his journey, he’s been meeting with politicians, and trying to raise the profile of skateboarding as a sport in Brazil. I really hope that the exposure he could get from his epic world-record-breaking journey will help with this. When I said to Marcelo that he should apply to Guinness for the world record, he said that it is not so much for the record, but to honor his father that he is doing the journey. I have contacted Guinness myself anyway, and hopefully they will get onto “officializing” this journey. The process for applying for and validating a record is pretty daunting (http://www.14degrees.org/en/?page_id=715), but it looks like Marcelo should have enough evidence to make a claim. If you want to help Marcelo along in this respect, you could contact Guinness World Records yourself, and encourage them to follow up on this amazing journey. Email me at rob.thomson@14degrees.org, and I will forward you on the contact details of a few people in Guinness in London who you can contact. Apparently he is currently working on a book and a film about his journey. I look forward to seeing them! Hi Lydia. Indeed, Drew’s attempt on my world record – he started skating on the 19th of March, 2014, if I understand correctly (http://switchkickamerica.blogspot.com) – will be very interesting to follow. I’m following him on Instagram, Facebook, and I’ve subscribed to his blog. He is a determined guy, and I wish him all the best! Marcelo, featured in this blog post, has been skating around South America for the last few years, and already has over 15,000miles under his belt! That’s over double the distance that I skated! Whether or not Guinness World Records will officially recognize his journey is up to them (I contacted Guinness World Records more than a year ago and encouraged them to follow Marcelo up, but I’ve not heard any word on whether he will be officially awarded the record or not). I had the opportunity to meet Marcelo personally. He has an incredible disposition aligned to an enviable will force. He also pedaled for Africa and the next step will be for Russia. We hope he continues to carry joy wherever he goes. And thank you for your recognition! I met him this morning on my walk in Cape Town. What a great guy! That’s great that you met him! Good to hear he is doing well.